Coronation Street legend, Kevin Kennedy, is to star as Jimmy’s Da in the UK tour of the critically acclaimed musical The Commitments written by Roddy Doyle, coming to the Theatre Royal Glasgow from 12 - 30 Dec 2016 and the Edinburgh Playhouse from 27 February to 4 March 2017. The UK tour will also feature many of the cast from the record breaking show’s two year run at London’s Palace Theatre, including Brian Gilligan who will reprise his starring role of Deco and Andrew Linnie who will star as Jimmy Rabbitte. Thirty years since The Commitments first burst from the pages of Roddy Doyle’s best-selling novel, the world's hardest working soul band will be going on a seven month UK tour. The smash hit musical will begin at the Churchill Theatre in Bromley on 3 October, before opening in Dublin for the first time ever. It will then travel to theatres across the UK until May 2017. Kevin Kennedy won the hearts of the nation when he starred as Curly Watts in Coronation Street. Since leaving Coronation Street, Kevin has regularly appeared in theatre productions including: Chicago, The Rocky Horror Show, Chitty Chitty Bang Bang and We Will Rock You. Brian Gilligan originally played the role of drummer Billy ‘The Animal’ Mooney in the West End production. Several months later, he was overheard singing to himself in the stairwell at The Palace Theatre and blew away the director, leading to him being cast as Deco a few weeks later. Andrew Linnie was originally part of the West End production’s ensemble, but saved the day when the actor playing Jimmy Rabbitte damaged his knee and both of the understudies were unavailable. Despite not having performed the role before on stage, Andrew stepped up to the plate to take over that the role that evening, and received a standing ovation after just a few hours rehearsals. He then carried on playing the role for the rest of the week and got great reviews for his performances. After performing the role in the West End, Andrew will now play Jimmy Rabbitte on the UK tour. The Commitmentettes will be played by sisters Amy Penston, (Natalie) and Leah Penston (Imelda), while Christina Tedders (Bernie) will complete the talented trio. Amy said: "I'm absolutely over the moon to be back with The Commitments playing Natalie. I'm so looking forward to working with some of the old gang and rock the stage together again. Not only that, but it's a dream come true to back on stage with my wonderful sister, Leah. We're just elated to be working together again!" Also appearing on the tour, having appeared in the West End production, are Peter Mooney (Derek), Padraig Dooney (Dean), Sam Fordham (Mickah) and John Currivan (Billy). They will be joined by Rhys Whitfield (James), Alex McMorran (Joey), and Christian James (Outspan). The Commitments received huge critical acclaim following the September 2013 World Premiere in London. Opening to rave reviews, it was quickly hailed as a smash hit musical sensation. The Sunday Times awarded the show five stars, saying “The Commitments is the musical we’ve been waiting for. So good, our critic almost weeps”. The Daily Telegraph and The Times both gave the show four stars and the Daily Mail said the show was “a fabulous fun night out". The show has been adapted for the stage by Booker Prize-winning author Roddy Doyle, from his original novel. Directed by C Jay Ranger, The Commitments is packed with more than 20 classic soul songs performed live on stage including: Night Train, Try A Little Tenderness, River Deep, Mountain High, In The Midnight Hour, Papa Was A Rolling Stone, Save Me, Mustang Sally, I Heard It Through The Grapevine, Thin Line Between Love and Hate, Reach Out, Uptight, Knock On Wood, I Can't Turn You Loose and more! 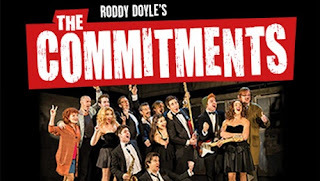 The Commitments tells the story of Jimmy Rabbitte, a young working class music fan, who shapes an unlikely bunch of amateur musicians into an amazing live act, the finest soul band Dublin has ever produced. The show follows the journey of two members of a frustrated synthesiser band – the opening scene has them playing, but ignored, in a shop window - who turn to Jimmy, the local music expert, for help. Placing a classified advert in a music paper, Jimmy auditions a number of wannabes before finalising the new line up who he names The Commitments. The humour kicks in as the band get to know each other and their instruments, and proceed through early rehearsals for their first gig. Just as they improve and begin to get a name for themselves they combust. The backing singers are all getting off with the middle aged horn playing legend, the singer has entered Eurovision, the drummer has walked out mid-gig and the saxophone player has dangerous leanings towards a jazz career.